A Journal Devoted to the Art of Living. Hollywood, CA. Publisher: Henry Hotchner. Editor: Marie R. Hotchener. 1/1, January 1931-1933. 86 pp., $3.50 a year. This was the successor to Hotchner assuming the editorship of the Theosophist and moving its place of publication to Hollywood. 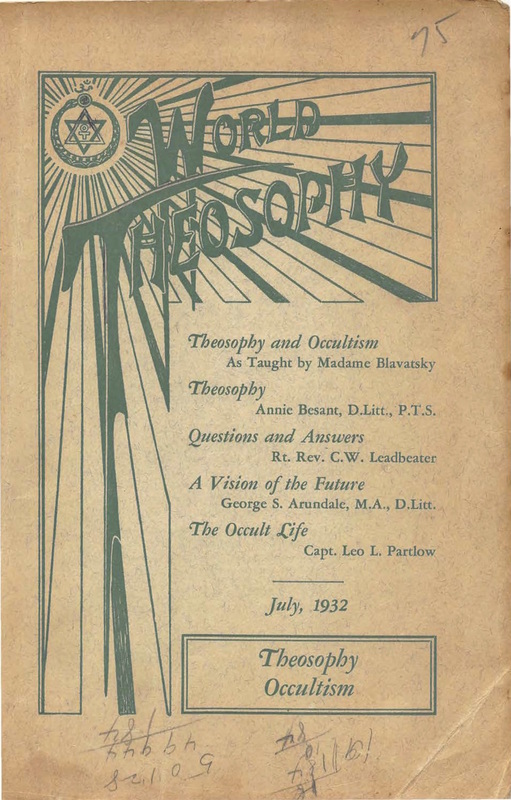 This lasted all through 1930, when Besant in India published the Adyar Theosophist, and with the issue of January 1931 Besant again resumed editorship and began publishing from Adyar and Hotchner renamed her journal World Theosophy. Hotchener also edited The Channel. Contributions by the usual Adyar Theosophists, including Bishop C.W. Leadbeaer, George Arundale, C. Jinarajadasa, et al. Indexed by the Campbell Theosophical Research Library, Sydney, Australia, online at austheos.org.